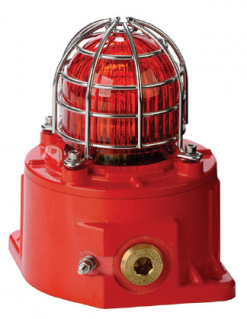 The GNExB1X05 are IECEx & ATEX approved 5 Joule Xenon Explosion Proof Beacons. The robust IP66 corrosion proof GRP enclosure and extended temperature range ensures the GNExB1X05 is suitable for all Zone 1, 2, 21 & 22 hazardous location signalling applications. The GNExB1X05 beacon produces over 117cd effective – a high output Xenon strobe flash required for safety signalling. The field replaceable colour filter enhances the strobe and is constructed from UV stable PC. The GRP enclosure features a threaded flame path, dual cable entries and a large termination area – all of which significantly reduce installation time. – 5J xenon strobe beacons. – 3 flash rates on DC version with remote activation. – Automatic synchronisation on multi-beacon systems. – User replaceable xenon tube. – Flash Rate: DC – 60fpm, 90fpm, double flash; AC – 60fpm. – Temp Rating (degrees Celsius): T4 -50 to +70, T5 -50 to +55, T6 -50 to +40. – Cable Entry: 2 x M20 x 1.5mm (one stopping plug included). – Construction: UV stable GRP (glass reinforced polyester) housing, glass lens, stainless steel guard. – Approval: II 2G Ex db IIC G b T4 (max ambient temperature +70 degrees Celsius), II 2G Ex db IIC G b T5 (max ambient temperature +55 degrees Celsius), II 2 G Ex db IIC G b T6 (max ambient temperature +40 degrees Celsius), II 2D Ex tb IIIC Db T110 degrees Celsius (max ambient temperature +70 degrees Celsius). – Certificate: IECEx UL 15.0003X. – Lens Colors Available: Amber, Blue, Clear, Green, Red, Yellow, Magenta. ESSG7101X 12VDC, 437mA, (specify lens colour). ESSG7111X 24VDC, 254mA, (specify lens colour). ESSG7141X 48VDC, 158mA, (specify lens colour). ESSG7121X 115VAC +/- 10%, 95mA, (specify lens colour). ESSG7131X 230VAC +/- 10%, 54mA, (specify lens colour).